Cecil’s Cajun Kitchen is named after the late, great, Cecil Doyle. Cecil is a DeRidder legend for the name he made for himself on and off the football field. 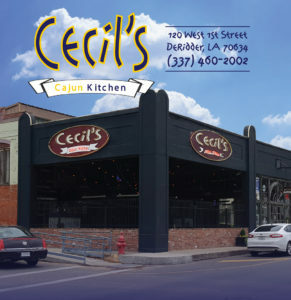 Cecil played for the DeRidder Dragons in the early 1940’s as a running back and punter. After graduation, he continued on to play football at McNeese State University and Tulane University. Cecil was also an Army veteran and served in World War II. After playing football and serving our great country, Cecil returned home to coach the DeRidder Dragons for 17 years. He may have retired his jersey but not his love for the game. Cecil ventured out from football and became an entrepreneur in the year of 1969 when he opened the doors of Master Chef. He later opened a Bonanza Steakhouse in the year of 1980. In 1990, the DeRidder Dragon Football Stadium was named after Cecil Doyle. This honor was a true testament to his character and loyalty to the community. Cecil and his wife, Pat, loved to entertain, so Cecil’s Cajun Kitchen opened its doors in 2008 with the goal to combine many of Cecil’s loves in life…sports, great food, and serving the people and community of DeRidder.